Apple has released new 21.5-inch and 27-inch iMacs with increased performance thanks to updated multi-core processors, optional Radeon Pro Vega graphics chips, and faster RAM. Apart from those changes, the iMac models remain the same as they were, not even picking up Bluetooth 5.0 or Apple’s T2 security chip, which is sad. The non-Retina 21.5-inch iMac remains available for $1099 but sees no changes. However, Apple tweaked the build-to-order options for the iMac Pro, which hadn’t received any attention since its launch 15 months ago (see “Apple Releases the iMac Pro,” 15 December 2017). It’s worth noting that Apple will almost certainly release macOS 10.14.4 Mojave and iOS 12.2 next week once these new iMacs join yesterday’s new iPads in Apple retail stores. watchOS 5 and tvOS 12 updates are likely as well, if only to participate in whatever security updates the main two operating systems receive. 2019 iMac Configuration Quirks: Don’t Get Burned! Before I get into the details, a warning is in order. When Apple last revised the 21.5-inch and 27-inch Retina iMacs (see “Apple Beefs Up iMac and MacBook Lines, Teases the iMac Pro,” 6 June 2017), a TidBITS reader pointed out that you could pay more or less for the same configuration, depending on how you started. For details, read the full article at “2017 iMac Configuration Quirks: Don’t Get Burned!” (12 June 2017), and note that the first two sections about the Radeon Pro options are still true of the new models. Faster CPUs with more cores: Previously, the 21.5-inch iMac offered a variety of quad-core Intel Core i5 and i7 processors ranging in speed from a 3.0 GHz i5 to a 3.6 GHz i7. The new models offer a wider range of 8th-generation processors: a quad-core 3.6 GHz Intel Core i3, a 6-core 3.0 GHz i5, and a 6-core 3.2 GHz i7. Without being able to see benchmarks, we’d be a bit worried about the performance of the low-end i3 processor. Updated GPUs: The previous 21.5-inch models were limited to Radeon Pro 555 and 560 graphics chips. The newer models feature Radeon Pro 555X and 560X GPUs instead, and for $350 more, you can upgrade to a Radeon Pro Vega 20 GPU with 4 GB of VRAM. Faster RAM: This probably won’t make much difference in performance, but the new iMac models come with 2666 MHz DDR4 RAM, up from 2400 MHz DDR4 RAM in the previous models. Keep the change in mind if you buy RAM from another vendor. Apple also tweaked the build-to-order options, letting you configure the entry-level 21.5-inch Retina iMac with 32 GB of RAM and a 1 TB SSD, neither of which could be combined with the slowest processor before. It’s a minor change—most people who would max out RAM and storage would also want one of the faster processors. We always recommend SSDs over Fusion Drives, but whatever you do, don’t get the 1 TB hard drive option; it will destroy the iMac’s performance. Apple should drop the hard drive model entirely. Pricing remains the same, with the low-end configuration starting at $1299 and a fully tricked-out machine coming in at $2999. The 27-inch iMac with 5K Retina display has long been one of my favorite Macs—I’m still using the original model from 2014 and a recent upgrade from 16 GB to 32 GB of RAM seems to have eliminated some nagging performance issues that cropped up with macOS 10.14 Mojave. However, it hadn’t received much love from Apple for ages—the last performance bump happened almost two years ago. Faster CPUs with more cores: The 2017 models of the 27-inch iMac all featured 7th-generation quad-core Intel Core i5 and i7 processors. Apple has replaced them with 9th-generation 6-core and 8-core i5 and i9 processors that should provide significantly more performance—Apple claims up to 2.4 times more. Each of the three base configurations starts with a 6-core i5 processor running at 3.0 GHz, 3.1 GHz, or 3.7 GHz. For the top two configurations, you can instead choose an 8-core 3.6 GHz i9 processor for the best performance short of an iMac Pro. 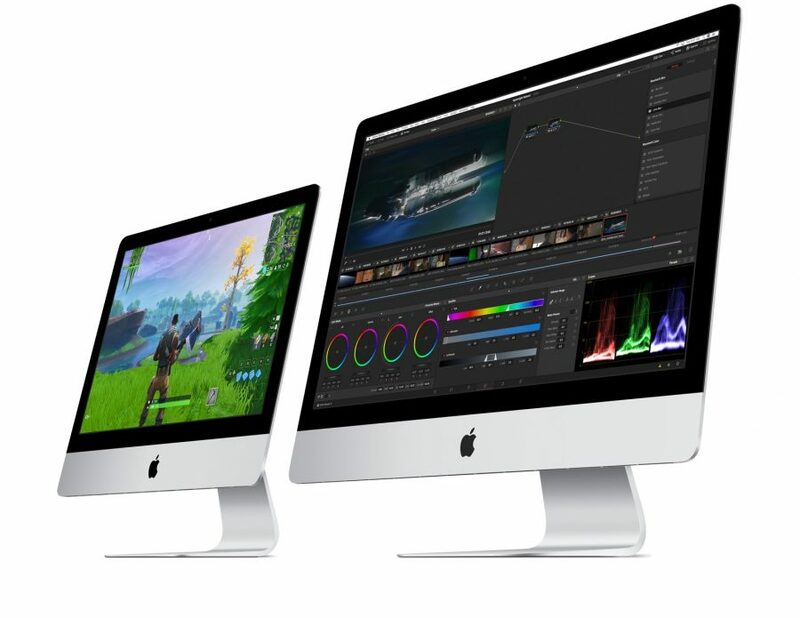 Updated GPUs: As with the 21.5-inch models, the 27-inch iMac GPUs move from the Radeon Pro 570, 575, and 580 to the Radeon Pro 570X, 575X, and 580X. An additional $450 gets you a Radeon Pro Vega 48 with 8 GB of VRAM. Faster RAM: Again, the new 27-inch models replace the 2400 MHz DDR4 RAM with 2666 MHz DDR4 RAM. Despite the notably faster processors, pricing stays the same, with the low-end configuration at $1799 and a maxed-out configuration hitting $5249. As powerful as the 27-inch iMac with 5K Retina display can be, it still doesn’t compare with an iMac Pro, which can be configured with an 18-core Intel Xeon W processor. Although Apple’s press release about the new iMacs didn’t mention it, the company also added some high-end options for the iMac Pro. You can now get it with 256 GB of RAM for a whopping $5200 and a Radeon Pro Vega 64X GPU with 16 GB of VRAM for $700. It’s a little freaky to imagine an iMac with more RAM than there is SSD storage in the entry-level MacBook Air. Simultaneously, MacRumors reports that Apple reduced the prices of some of the build-to-order options, cutting $400 from the price of RAM upgrades, $50 from the Radeon Vega Pro 64 graphics processor price, and $400 from the 4 TB SSD storage option. It’s hard to quibble with any of these changes—faster performance for the same price is a good thing. But none of these improvements are significant enough to warrant upgrading from an existing Retina iMac. The fact that Apple updated these models and added some high-end options to the iMac Pro also suggests that the company doesn’t plan to do anything more significant with them for the foreseeable future. Of course, the elephant in the room for some people is the update to the Mac Pro, which Apple promised for sometime this year. It’s relevant mostly to those who have been debating whether to move from an older Mac Pro or 27-inch iMac to an iMac Pro now, or to hold out for whatever Mac Pro Apple releases next. But if you’ve been waiting to upgrade to a new iMac from a significantly older Mac, now is as good a time as any. I have been waiting for this update. The advice to start with a higher-end model rather than upgrading a lower model still applies - the $1999 and $2299 models end up at $3399 if you upgrade to 16 GB of RAM, a 1 TB SSD and the 8 core i9 CPU. What I don’t know is what performance improvement I would get from upgrading from the 580X GPU to the Vega 48. You can’t find benchmarks for these imbedded GPUs and these appear to be specific to Apple. I don’t see the value of upgrading the i5 to the i9 since they are both 9th gen and 6 vs 8 cores is not likely to be material, given the state of multi-threading in applications. I’d be interested in hearing how others are evaluating these choices. Yeah, it’s funny that you get a better GPU just by starting with a different config. I have to assume that Apple just replicated the previous setup, which has had this quirk since 2017.
glad I waited. And thanks for the note on the configuration quirks. myself, but may not have too. Educators and audio people are rather happy the new iMacs don’t have the T2. Minor quibble: Some of the new processors are 8th generation, according to Apple, not all 9th generation. Yes, as the article says, the 21.5-inch iMac got 8th-generation processors, while the 27-inch iMac got 9th-generation processors. According to Apple’s “Choose your new iMac” page the two lower-end 27" iMacs start out with 8th generation i5 processors. The middle model offers an upgrade to the i9. So yeah, pay very careful attention when configuring an iMac if you want the latest.